This relatively common profile includes two factors that appear in some ways to be contradictory. On one hand, Influence is the factor of excitement, enjoyment and extrovert impulsiveness. On the other, Compliance is related to precision, detail and carefully-followed rules. The ways in which this apparent contradiction are resolved form the backbone of the interpretation for this type of behaviour. The differences in approach between these two factors are resolved in an unusual approach. Normally, two or more high DISC factors will tend to reinforce each other's common points, and blend to make up the entire style. This is not the case with the two opposing styles of Influence and Compliance - what we see instead, with this type of style, is one factor (Influence) appearing in relaxed, open and favourable situations, while in more formal or structured circumstances, the other (Compliance) will come to the fore. The ways in which this style will relate to other people is highly dependent on the circumstances under which an encounter takes place. Within a close circle of colleagues of friends, this style is capable of quite confident and extrovert behaviour. In a more formal work environment, or pressurised atmosphere, such as an interview for a job, this confidence will often seem to evaporate, and the style will fall into line with its more Compliant aspect. Would you like to find out more about this DISC profile? What's Inside the Personal Report? This is the profile you're currently viewing. If you'd like to choose different factors for your report, just change the settings on this graph before you continue. Please take a moment to enter some basic details about you that will appear in your personalised report. We'll also need your e-mail address so that we can mail a copy of the report to you. Personalised reports cost just £10 each (plus VAT within the European Union). Please enter your payment details here, and we'll generate your personalised report instantly. As soon as your payment is processed, we'll send your personalised report instantly. Thank you for creating a personalised profile report. Your report is ready to download, and we've also mailed a copy to the e-mail address you entered. If you have any questions about your report, or our other services, please feel free to contact us. This personality style combines the abilities of a pure High-I and a High-C, but, as we have noted above, these abilities will not all be apparent at the same time. Different environments will produce different responses, and so a manager requiring a certain style of behaviour from this type of person should ideally adapt their working environment to suit the type of responses they are looking for. Note that, in most cases, the profile type will normally show an Influence factor higher than their Compliance factor (although, by definition, both must be relatively high), and so confident, communicative behaviour will be more commonly seen than their reticent, cautious side. This person's motivations are more complex than most, because of the opposing natures of their two main factors. Their high Influence score means that they are interested in the attention and approval of others, but because they also have high Compliance, this element of their approach is less likely to be demonstrated overtly, and will instead be more subtle and discreet. Compliance is the factor of certainty and sureness, and this type of person will look for a clear idea of their position and the expectations of those around them. Again, however, the complex interplay of factors in their behavioural style will affect the way that they express this need, and they are far less likely than a pure High-C to ask for explicit instructions directly. This is a general interpretation discussing the overall trends in profiles of this kind. 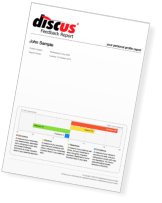 For a specific DISC analysis, create a DISC profile online using our Discus service, or through the Axiom site's own quick DISC profiler.